The clinic was opened in 2001 by Dr & Mrs Jilani, offering for the first time a wide range of advanced cosmetic treatments to Isle of Wight residents, who previously had to travel to London for treatment. Since 2001 The Island Cosmetic Clinic has been using safe and effective cutting-edge technologies, and is a well-respected leader in advanced cosmetic treatments in the UK. The Island Cosmetic Clinic is the only cosmetic clinic in the country to be a Finalist for 3Â MyFaceMyBody Awards. The Island Cosmetic Clinic is one of the most popular cosmetic clinics in the South of England and Hampshire, with thousands of loyal and satisfied clients from all over the country and abroad visiting for treatment. We are proud that more than half of our clients have been recommended by their friends and family, and our service and care cannot be matched. We have a small intimate team of highly qualified, experienced and friendly staff. Dr. Jilani personally supervises the training and ongoing education of all of the staff at the clinic. We understand that our clients are unique with their own individual needs. During the past 10 years, we have been changing people’s lives by improving their self-esteem and confidence. We provide genuine and caring advice, with our client’s best interests at heart. Our clients come first and their safety and satisfaction is our top priority. At The Island Cosmetic Clinic we have created a private, caring and relaxed environment to make your visit enjoyable and memorable. 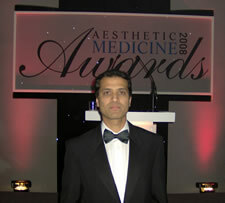 The Island Cosmetic Clinic has been nominated for the prestigious Aesthetic Medicine Awards for Best Customer Experience 2008. The Island Cosmetic Clinic is situated in a private, out of town location in Wootton,Isle of Wight. It is close to all the ferry terminals, ideal for people from all over the UK, south and southeast with good transport links to Southampton, Portsmouth and Lymington in the New Forest area. So if you are considering cosmetic treatments for the first time, you can be rest assured you will be in good hands. Visit The Island Cosmetic Clinic and talk to our doctor and aestheticians, or simply to view our facilities.